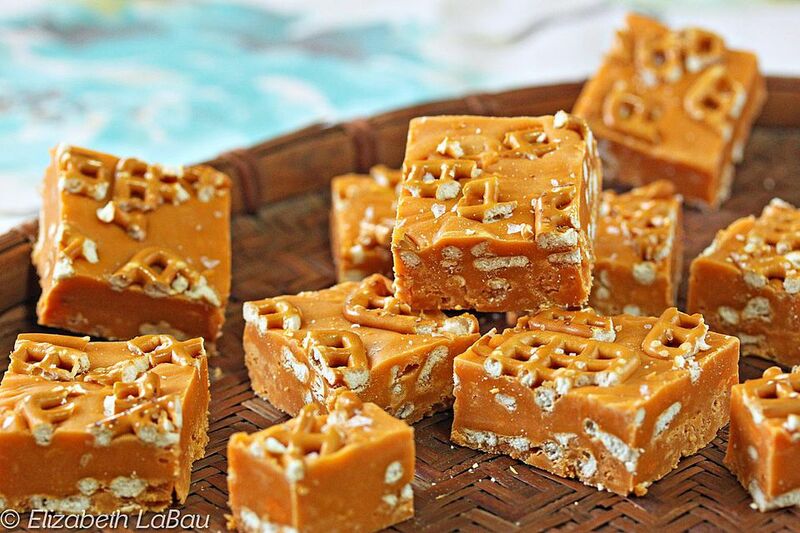 Pretzel Butterscotch Fudge is both salty and sweet, crunchy and creamy! You'll love this easy and addicting fudge. I like topping it with a big pinch of sea salt, then serving it in small slices for a perfect after-dinner treat. Line an 8x8-inch pan with foil, and spray the foil with nonstick cooking spray. In a medium saucepan, combine the sugar, evaporated milk, butter and salt. Place the pan over medium heat and stir while the butter and sugar melt. Stir occasionally while you bring the mixture to a boil. Once it comes to a boil, set a timer for 5 minutes and cook it, stirring frequently . After 5 minutes, remove the pan from the heat. Add the marshmallows and butterscotch chips, and stir until they melt into the fudge and the mixture is smooth. Add most of the chopped pretzel to the fudge, reserving about 1/4 cup to sprinkle on top. Stir well until the pretzels are well-mixed. Scrape the fudge into the prepared pan and smooth it into an even layer. Top it with the remaining crushed pretzels and gently press down on them to embed them in the fudge. If desired, sprinkle the top with a pinch of flaked sea salt. Refrigerate the fudge for 2 hours, until very firm. To serve, lift it from the pan using the foil as handles. Cut it into small squares. This fudge can be kept in an airtight container in the refrigerator for up to 2 weeks, but for the best taste and texture, bring it to room temperature before serving.